I love felt... all sorts. I like making little hand-sewn doo-dads with wool felt yardage, I like felting old sweaters and using the fabric to make stuff, and I like knitting and then felting bags and other goodies. 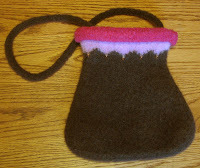 Recently I finished a cute little felted bag for my partner in the August Bag Ladies swap. The theme was brown + a color. The photos here show before and after felting. 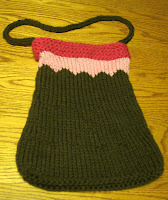 I've made this bag before, in fact I made several for my nieces for Christmas two years ago. It goes pretty fast, has some nice details, and is a good size.I hope my partner likes it! I am one keen felter also (as you can see on my flickr/blog/etsy), and also I would love to get some more info of those gorgeous swaps of yours! Is there way I could participate (I am all the way here in Finland),and where could I apply? If you have a minute to spare, I would appreciate highly if you could show me a link or...? I should be studying this very minute but... ;) I will look through your beautiful blog instead!